In the fall of every year, an incredible phenomenon takes place in the Central Valley: the fall salmon run. 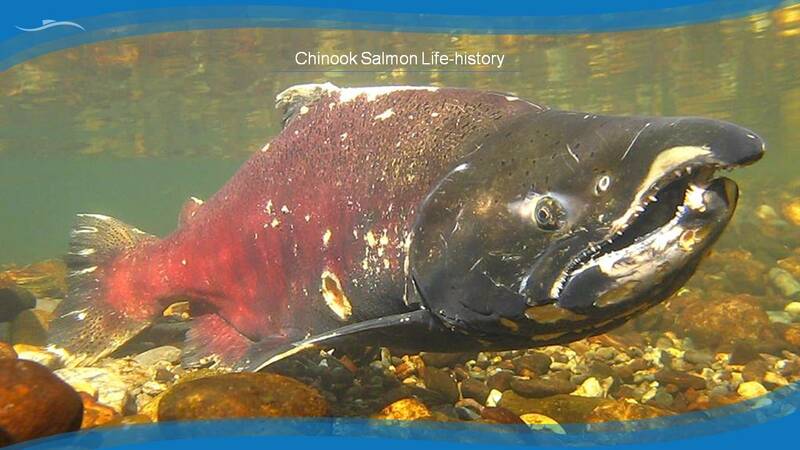 Adult salmon travel many miles from the Pacific Ocean upstream to their spawning grounds, returning to the river where they were born, sometimes even to the same riffle, where they will spawn, laying their eggs in the gravels of the rivers and streams. Once hatched, the young salmon will spend several months, sometimes longer, lingering in the freshwater until it is time for them to migrate down the rivers, through the Delta, and out the Golden Gate. After a few years at sea, the adult salmon will begin their long and final journey upriver to return to their birthplace, and thus the cycle continues, a timeless dance in the circle of life. It’s an event that has taken place in our local rivers for thousands of years. Salmon have existed more than a million years and have evolved with California’s climate. However in recent decades, populations of salmon and other native species have experienced significant declines which studies have attributed to several factors, including overuse of water resources, habitat loss and degradation, and overfishing. The construction of dams across rivers has blocked access to the spawning grounds above them; the flood control provided by these dams and the development of cities and farms on the valley floor has eliminated much of the floodplains that historically, young salmon and other native fish utilized for rearing and feeding. 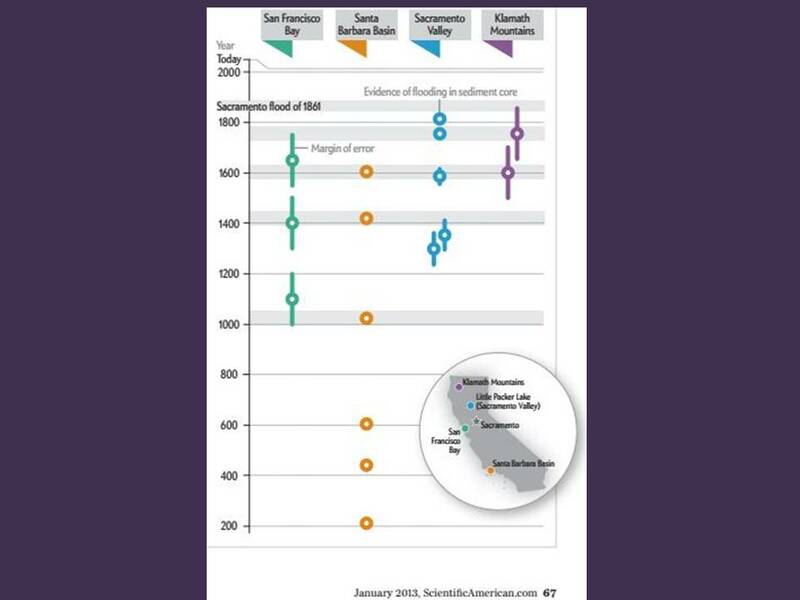 It would seem that California’s management of water for is not working for anyone, human or otherwise. Environmental advocates argue that water quality and flow standards do not adequately protect fish and wildlife, and regulators have failed to enforce these requirements when they are most needed, while agriculture and urban interests say these regulations have been ineffective and expensive in both dollars and acre-feet. However, if fish populations continue to decline, regulators may likely conclude that more water is needed to support struggling fish populations, further stressing already tenuous water supplies. 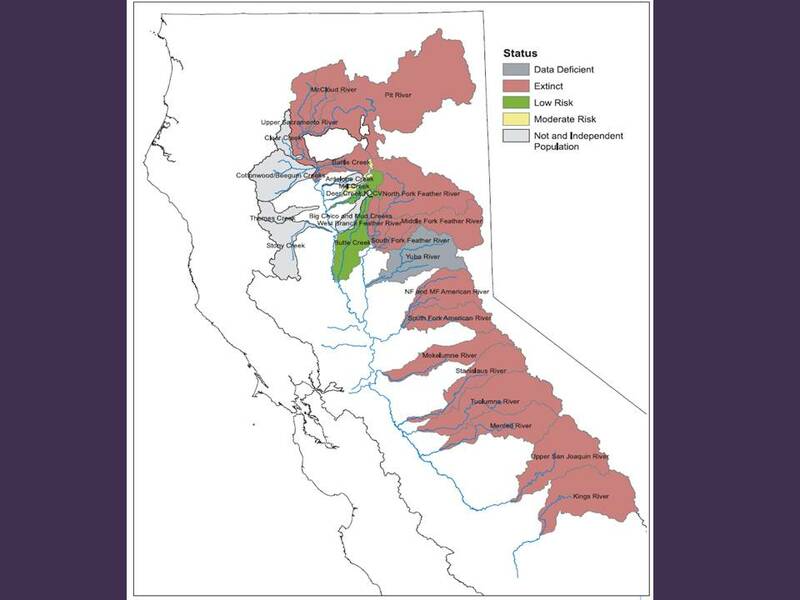 At the Mountain Counties Water Resources Association forum,The Sacramento-San Joaquin Delta and its Sierra Nevada Tributaries: The Stressors and the Fix, fish biologists discussed the status of salmon and other native fish in the tributaries. First, Dr. Bruce Herbold, retired EPA and fisheries consultant, gave an overview of native fishes and talked about how the habitats have changed since humans have developed the landscape. 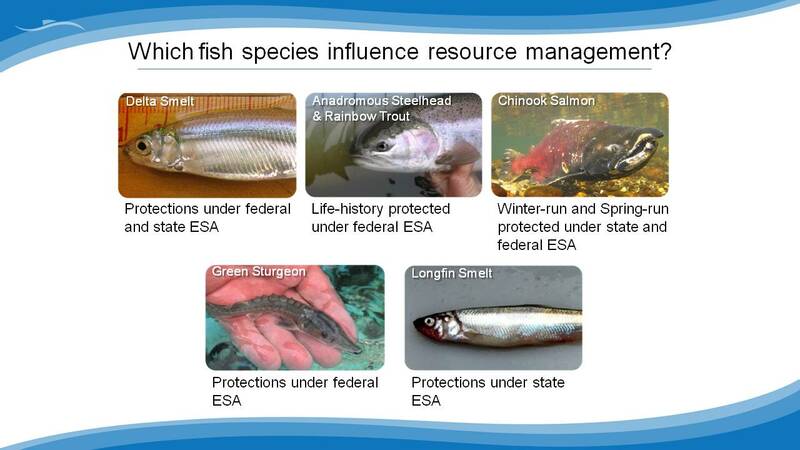 Next, Doug Demko, president of FishBio, then discussed the effects of predation and hatcheries on salmon. 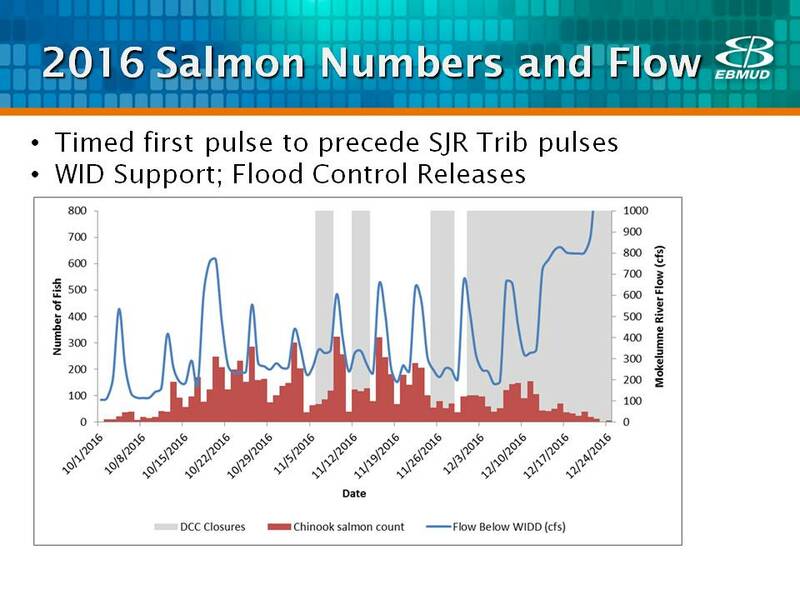 Lastly, Jose Setka, Manager of the Fisheries and Wildife Division at East Bay Municipal Utilities District, discussed the factors behind the success of salmon on the Mokelumne River. Unfortunately, the construction of dams has blocked access of the spring run to those spawning areas, with Deer and Mill Creek being some of the few remaining spots for cold water, Dr. Herbold said. 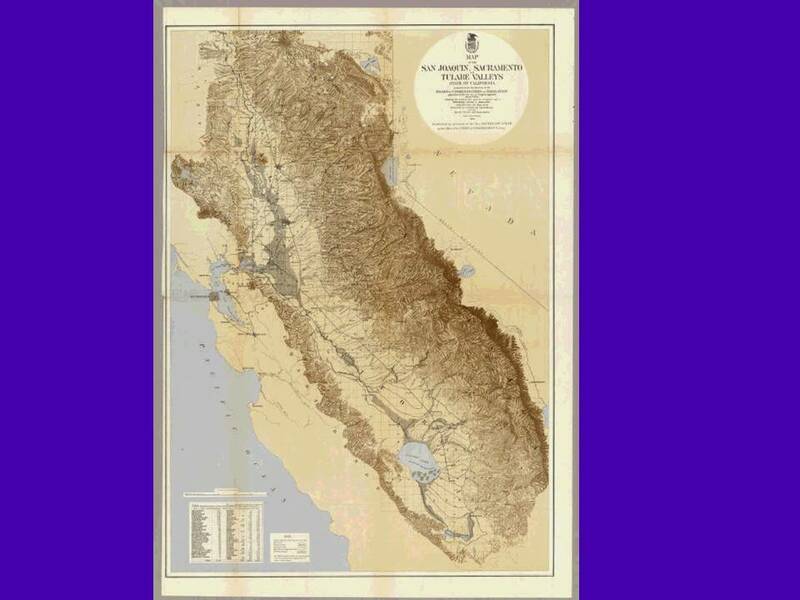 “Our grandparents also simplified things,” Dr. Herbold said, presenting a map of the Central Valley pre-development. He noted that the gray in the middle indicates the historic wetlands, almost all of which is gone now. In the Delta, we refer to the lands as islands, but instead of sticking up out of the water, they are more like bowls in the water and the levees are more circular dams. Today, the problems we face are changes in climate, invasive species, and aging infrastructure. Dr. Herbold then discussed each of those in turn. 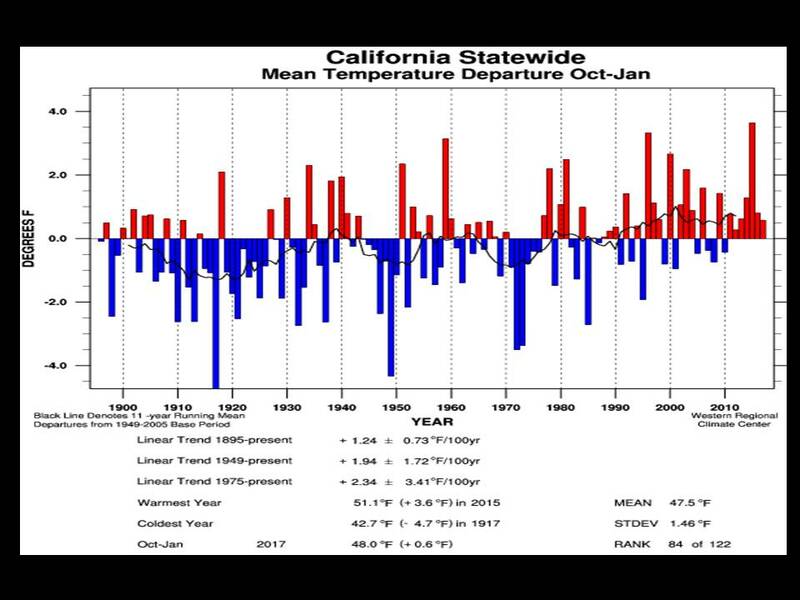 He presented a graph of Central Valley runoff from 1906 to present day [below, left], pointing out that in 1976, they had a critically dry year, followed by the driest year on record (at the time), and Shasta Dam was drawn down so far that there was no cold water for the winter-run salmon. Dr. Herbold then gave his conclusions. We can’t solve the problem with any single thing, Dr. Herbold said. “Some sort of getting those thousands of water users on board with a statewide solution is the only solution that I see that has any hope of working,” he said. Doug Demko started working with salmonid fisheries with his first job in 1989; most of his work has focused on evaluating the impacts of flows and hydropower on salmon populations. Mr. Demko’s company is FishBio; it’s a private company with about 75% of funding currently coming from industry and the remainder from NGOs and government contracts. 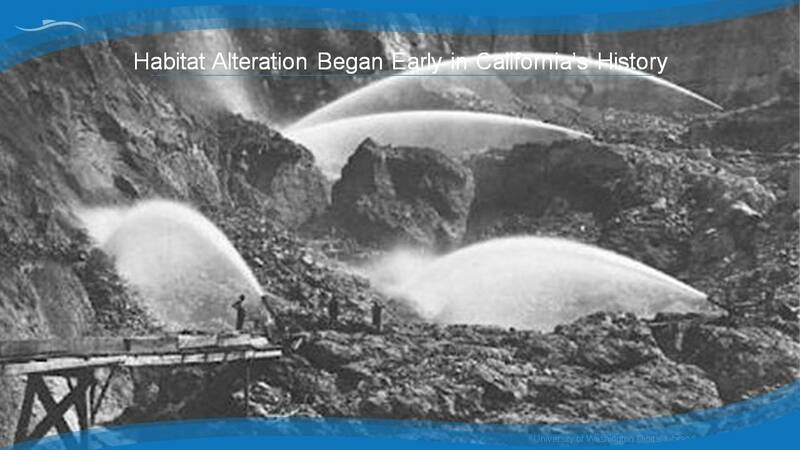 Mr. Demko noted that the construction of dams in California during the early and mid 20th century have blocked 85+% of the historical habitat for salmon and steelhead; however, habitat degradation and change dates back to California’s earliest history during the Gold Mining era when hydraulic mining was washing mountains away and the sediment was moving downstream into the lower rivers and the Delta, creating flooding problems. 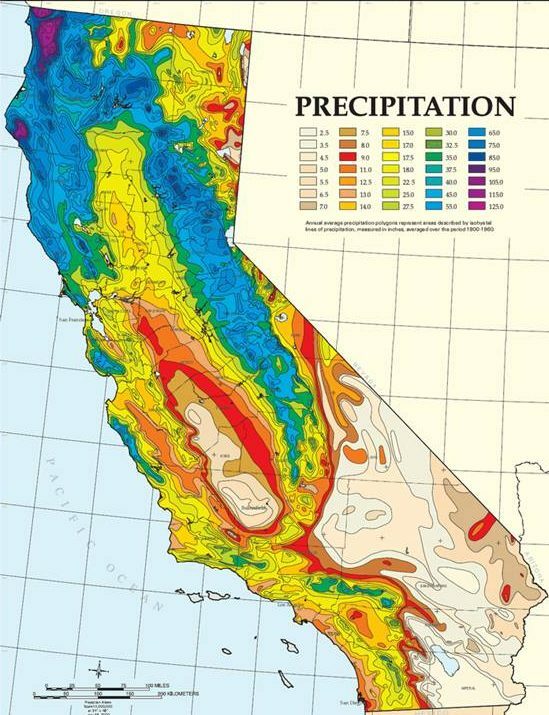 Add to that, railroads were being constructed along streams, trees were being cut down, water was being diverted, and so the problems California is dealing with today with declining native fish populations are deeply rooted, going back to the early days of the state’s history, he said. 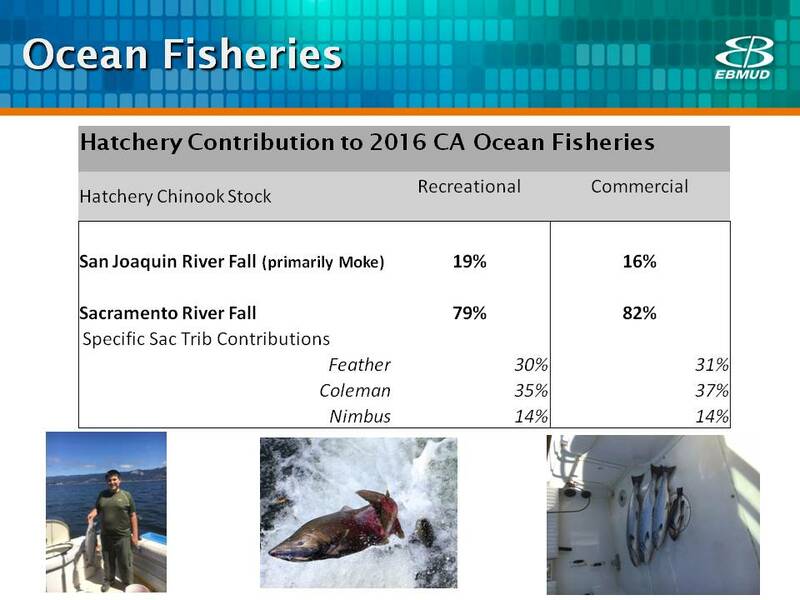 He presented a slide showing the top 5 fish species, noting that the Delta smelt, steelhead, and salmon getting the majority of the funding. “Since the early 80s, we’ve spent hundreds of millions if not billions of dollars on restoration and physical projects to improve conditions for salmon, but what people outside of the industry don’t see is if you get to peek behind the curtain … the amount of work when you look at the consultants, the attorneys, and all of the other people that are involved with it – very little of the money actually seems to make it to on the ground projects, which I think is one of our challenges,” he said. 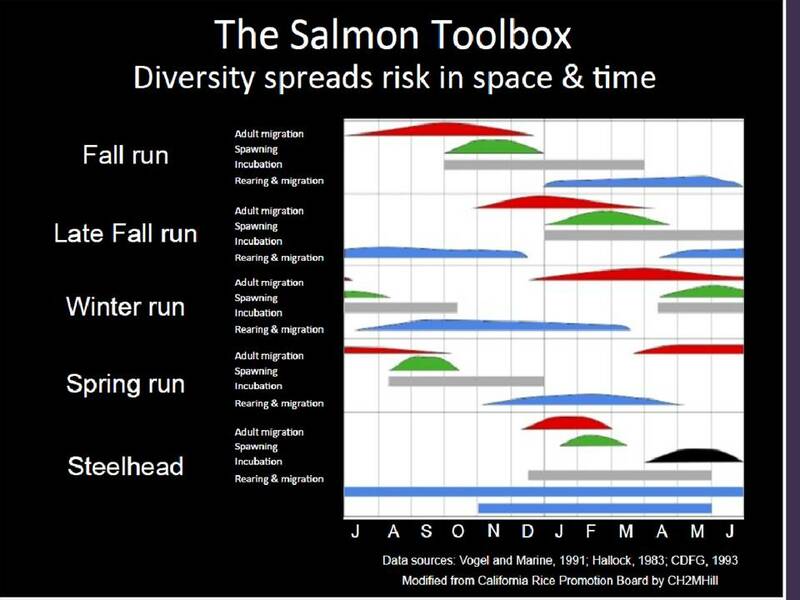 The life history of the salmon is complex. When salmon are in the ocean, they are bright silver; it is when they come back to spawn that they turn red and develop the big hook nose. The female will lay the eggs, the male fertilizes the eggs, and the juveniles remain in the gravel for anywhere from a month or two before they spend the next 6 months migrating downstream through the lower rivers and the Delta out to the ocean where they will spend a couple of years before they come back to spawn, usually in the same stream and sometimes even in the same riffle where they were born. 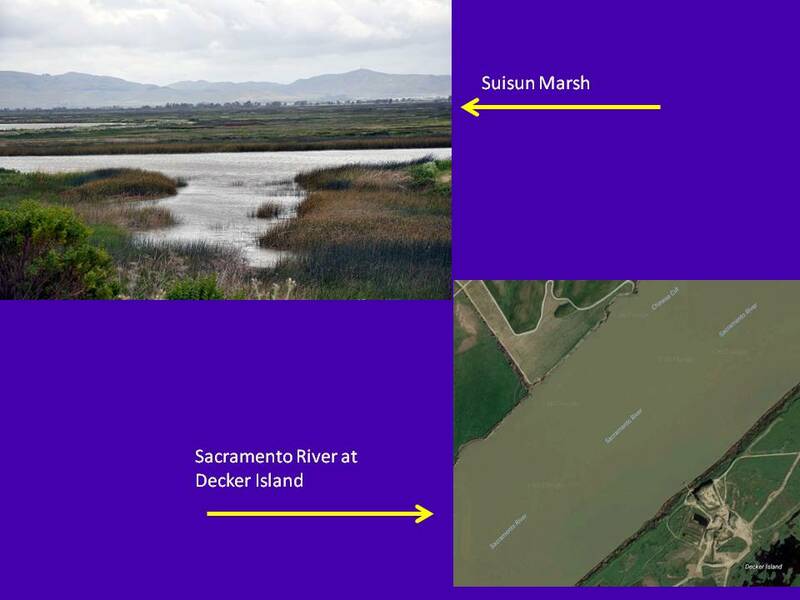 He presented a picture of a natural landscape in the Delta [below, left], noting that this is good habitat for a fish. It’s shallow water, the vegetation provides food and good cover for baby fish. This is what the historical Delta or even some of the floodplains would have looked like, he said. The increase in invasive species is tied to changes we’ve made in flows and the changes that we’ve made in habitat over time, and it starts at the food chain – with the phytoplankton and the zooplankton. 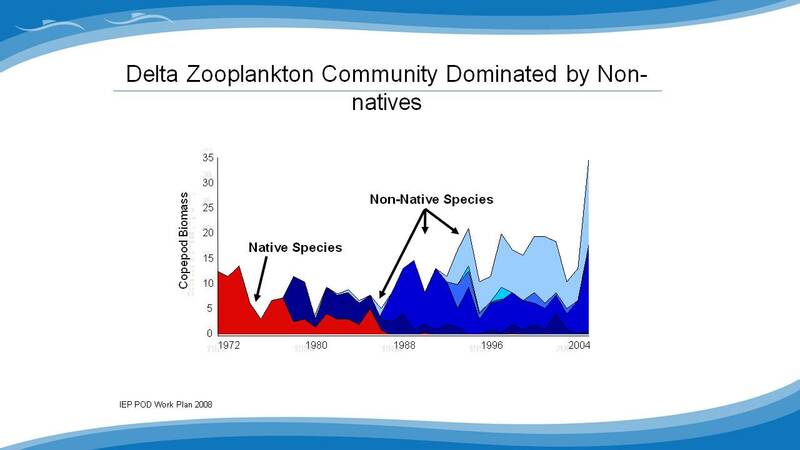 He presented a graph showing how the Delta zooplankton has changed to predominantly non-native zooplankton species. 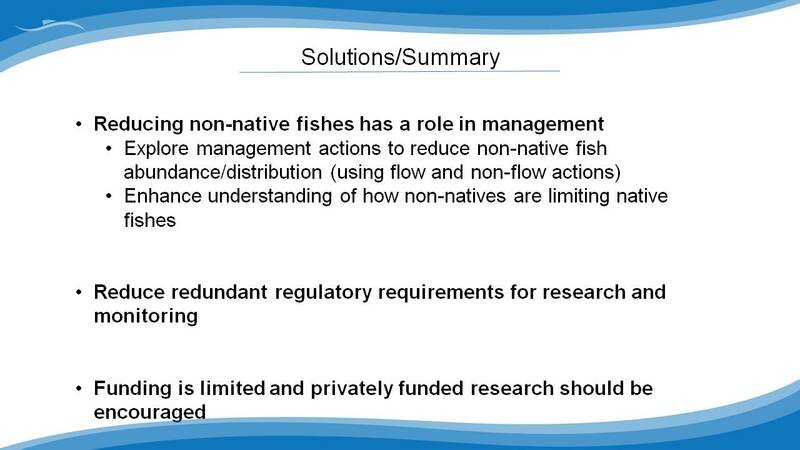 Mr. Demko said it will be key moving forward for researchers to determine the true impacts of these non-native food sources on fish populations. 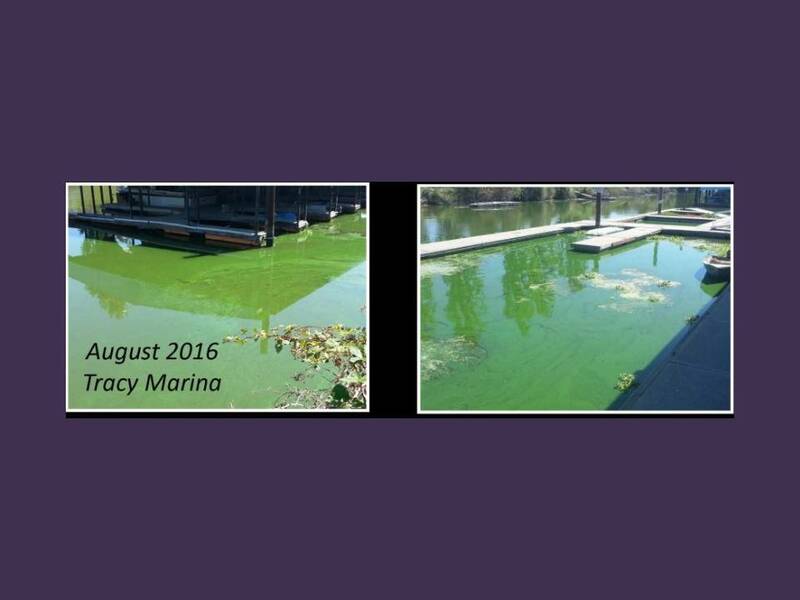 The even more difficult question is how to rectify it; there are challenges dealing with big animals that are easy to see and easier to research, but it’s much harder for phytoplankton and zooplankton, as well as submerged aquatic vegetation, he said. 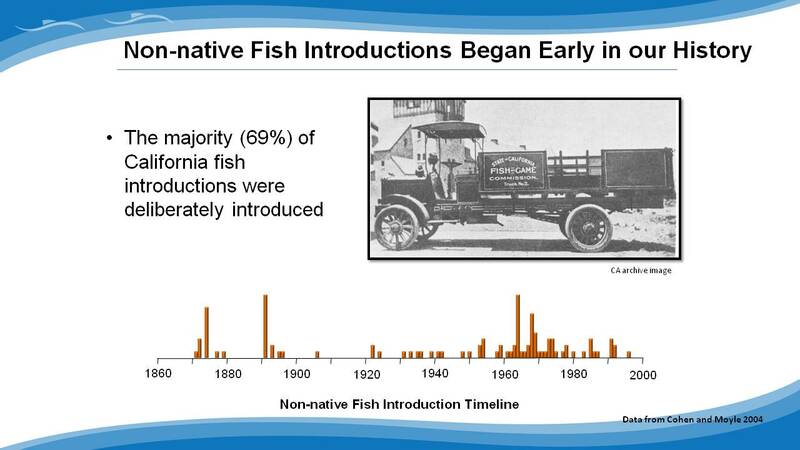 He noted that people are often surprised to learn that the non-native fish populations here in California are largely a problem that we created by intentionally introducing desired species, such as striped bass or other big game fish. 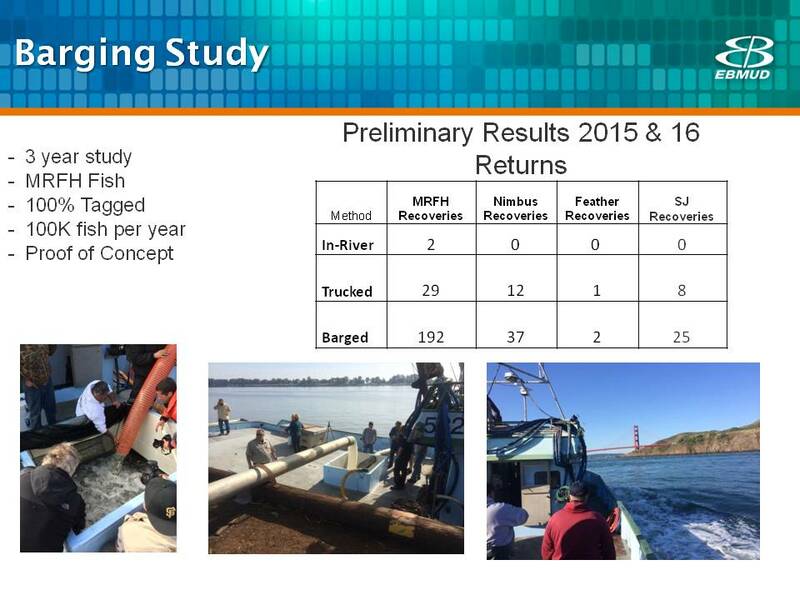 Studies of survival of outmigrating salmon from Mill Creek found that out of 300 juvenile salmon, just one made it to the Golden Gate, which is less than 1% survival through the system. 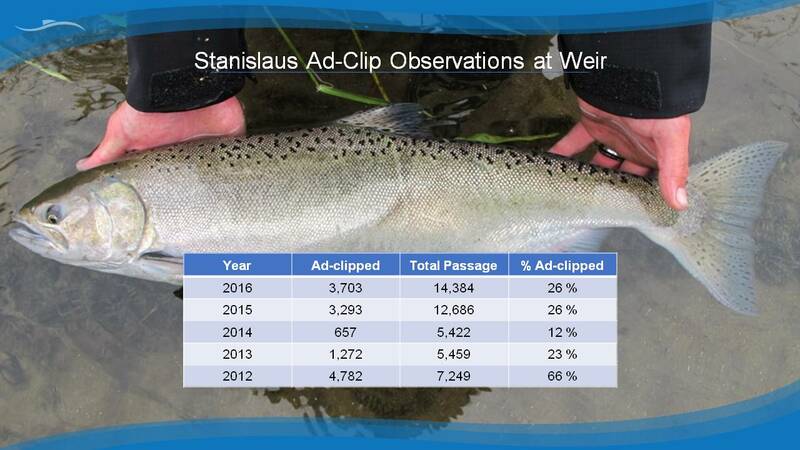 The lower Stanislaus River telemetry studies by the US FWS found average survival rates between 7 – 25%. Mr. Demko noted that he’s been working in the Stanislaus since 1991 where they operate rotary screw traps and do production estimates upstream and downstream every year. 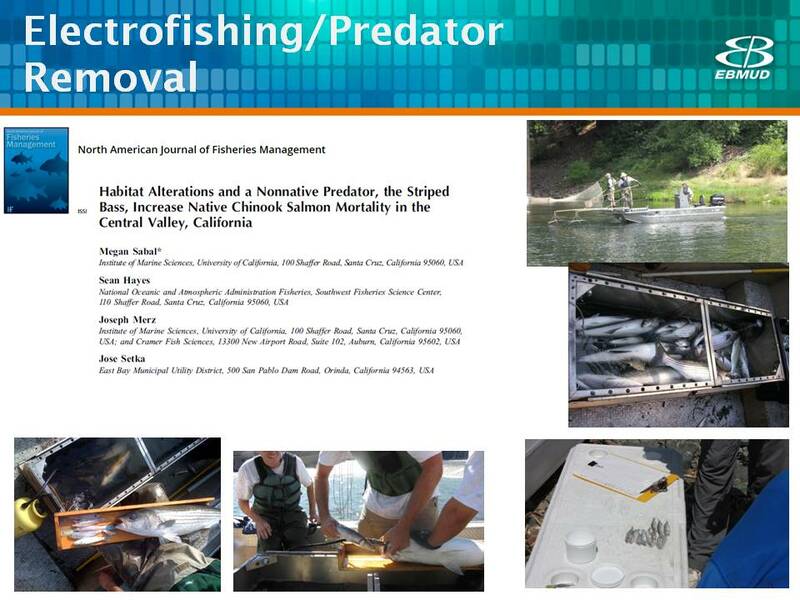 Mr. Demko did a study specifically looking at predation and survival in the Tuolumne River in 2012. 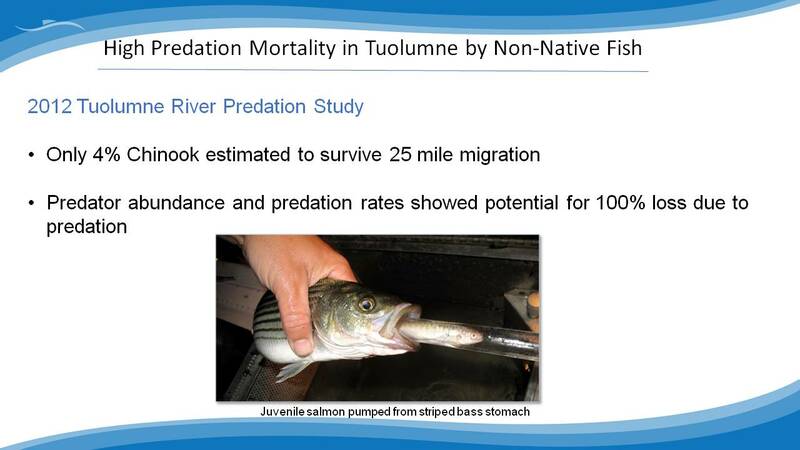 It was a study with extensive stakeholder involvement, and what they found was that only 4% of the juvenile salmon were estimated to survive the 25 mile migration – and the study site ended at River Mile 6. 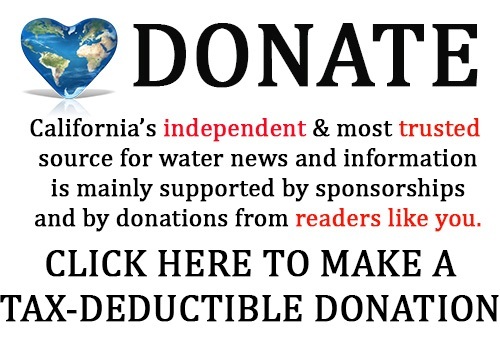 “They still had to go six more miles down the Tuolumne River, then they had to make a right turn and go down San Joaquin River, and then they had to go down the Delta, so it’s with a straight face that I tell you that in some years, nothing – zero – nothing makes it out of our tributaries,” he said. He acknowledged that after the study was completed, at least one of the agencies didn’t really agree with the findings, so they went back to the drawing board, added some university partners and more experts, turned the half million dollar study into a one million dollar study, and then were denied permits to do the study in 2014, so the 2012 study has to serve as the best available science for the Tuolumne River. 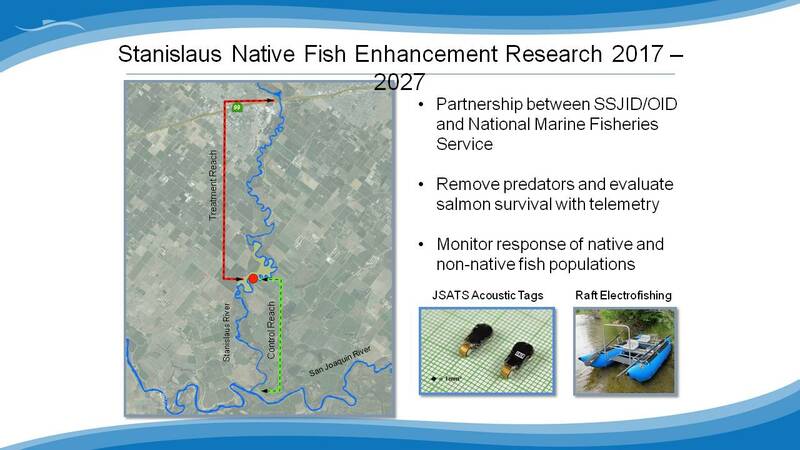 They have also been trying to do similar work on the Stanislaus River since 2009, and last year, one of the provisions in the WIIN Act was to allow the study of non-native fish and predators on the Stanislaus River. It’s a highly ambitious project they have started planning with field work to start in 2018. 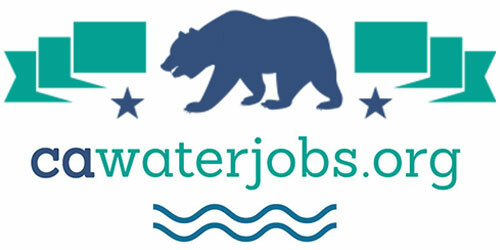 The project is being funded by the South San Joaquin Irrigation District and the Oakdale Irrigation District, and NMFS. 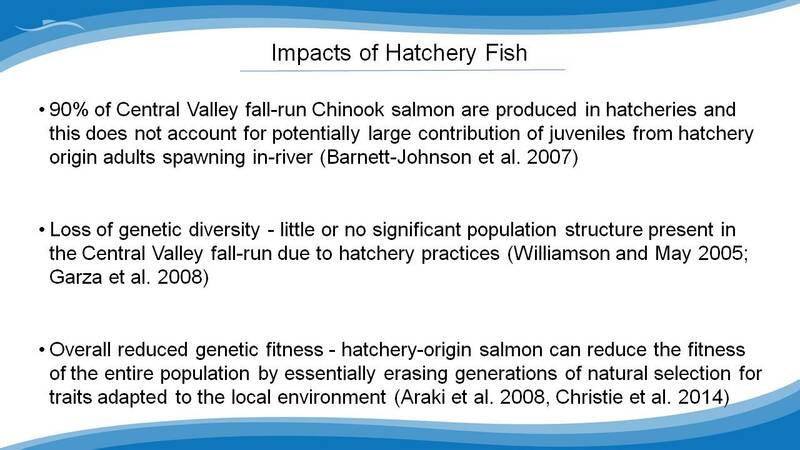 Salmon hatcheries are also really ingrained in our culture, Mr. Demko said. The first salmon hatchery in California was built in 1872 on the McCloud River because even by then, the impacts of mining and water diversions already had significant impacts on salmon populations. The first salmon cannery was also on the Sacramento River, so harvest rates of salmon coming back to the river were really high, he said. More recently, in the past four to six decades, as we’ve built dams, we’ve built hatcheries to mitigate for the loss of upstream habitat. 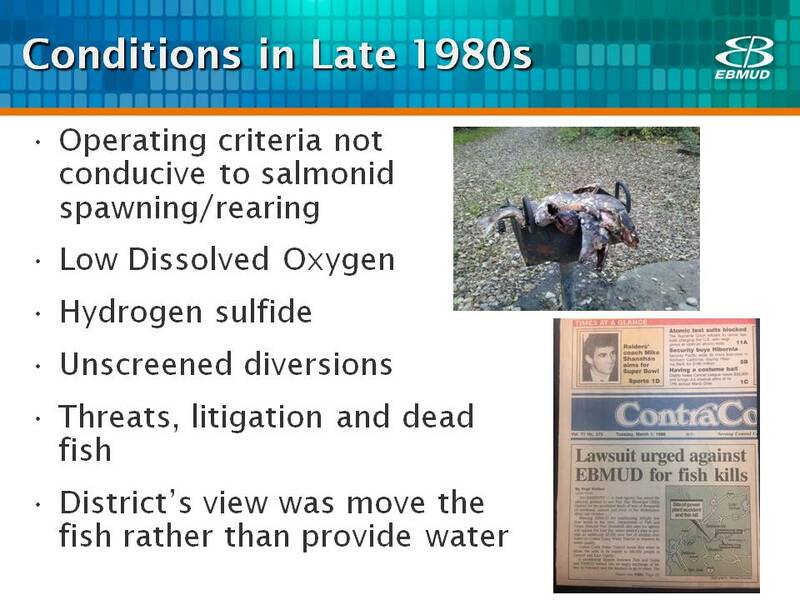 Jose Setka, Manager of Fisheries & Wildlife Division for the East Bay Municipal Utilities District, then discussed the work EBMUD’s been doing on the Mokelumne River as a result of litigation back in the 1980s, work that he views as being largely successful. 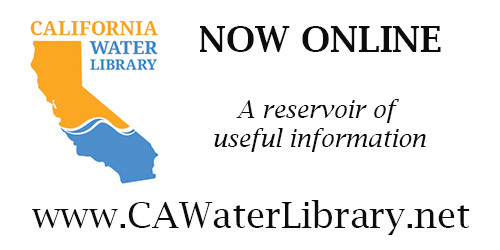 As a result of lawsuits, the agencies and water district developed the first technical advisory committee, the MRTAC, which tackled a number of issues. Some of those issues included the Delta Cross Channel, flow patterns, and export impacts to outmigrants. There were a number of key issues that the technical advisory committee focused on finding solutions for. One of them was a tenfold increase in water, which was important because at the time, they weren’t releasing a lot of water down the river. However, it was the formal collaboration with resource agencies and stakeholders to optimize river management that Mr. Setka said that’s led to the most success. Many organizations and groups wouldn’t work with them and were probably suing them back in the 80s, but today those groups are collaborating with the district. 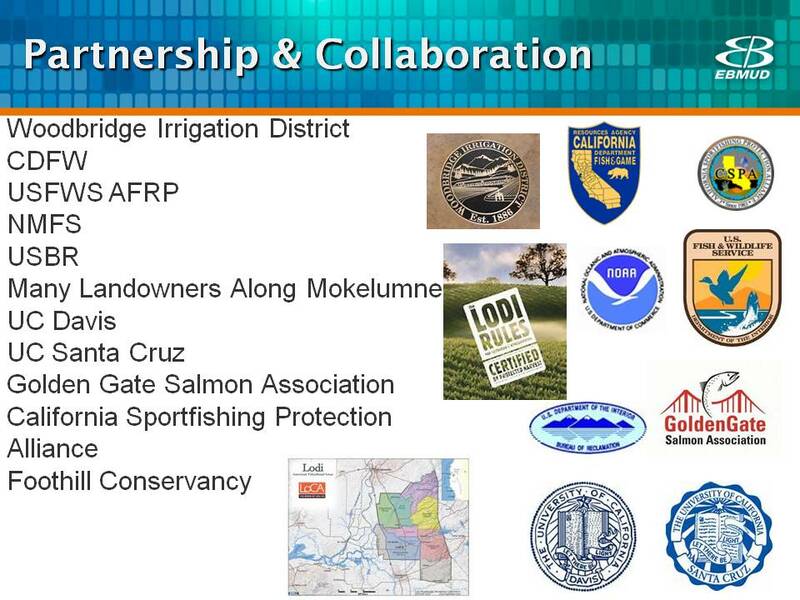 The collaboration now includes the state and federal fisheries agencies, local stakeholders, universities, and NGOs. “Collaboration is the most important issue in this whole process that has led to our moving forward on some successful outcomes,” he said. EBMUD has worked cooperatively with the downstream Woodbridge Irrigation District to improve fish passage in the lower Mokelumne River, helping to increase survival. 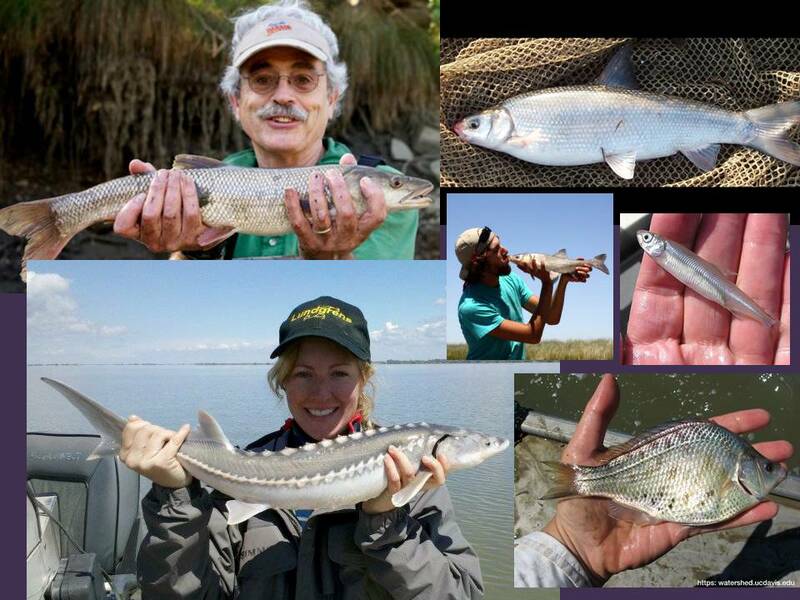 One of the important things resulting from the collaboration was establishing a monitoring program on the river. 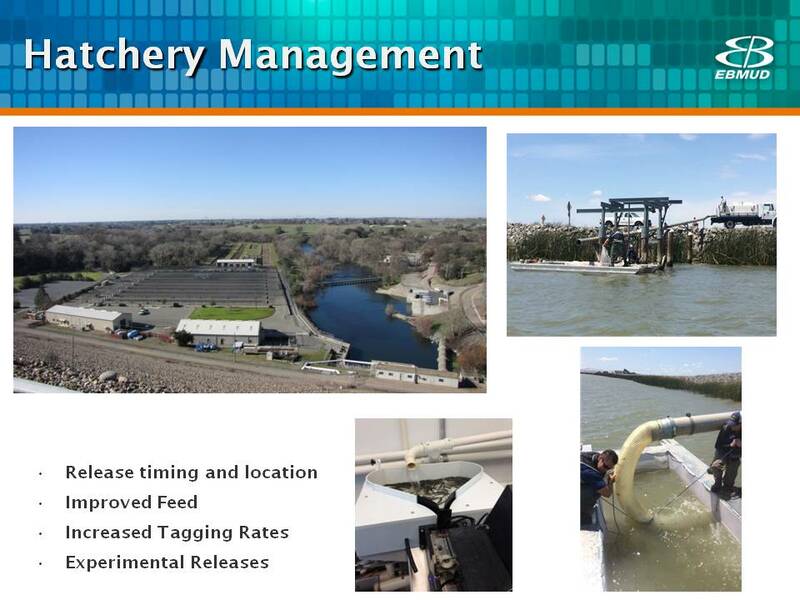 There are a number of different types of monitoring they do, but one example is at Woodbridge Dam, they have a camera, a ladder, and they can count every single adult salmon that comes into the system, he said. They also took steps to improve the quality of the feed for the hatchery fish. “Historically when DFW was in charge of making all the purchases for the facility, the lowest bid won, so poor feed quality which means you have poor fish quality going out, so we made some changes there and that has certainly improved,” he said. Mr. Setka also noted that tagging the fish has cost them about a half million dollars a year to do, but it provides a lot of information that they then try to use to make management changes. 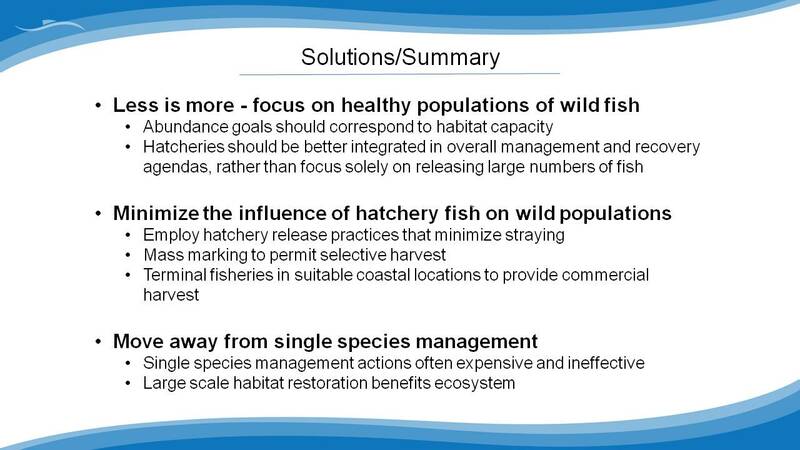 They have also done a lot of experimental releases to see where things might work better in terms of where the fish are released, the timing, and locations. The Delta Cross Channel has been a significant problem for them in terms of fish migrating up and juveniles migrating out. The forks of the Mokelumne River are used as conveyance for water from the Sacramento River down through the Central Delta to the pumps. 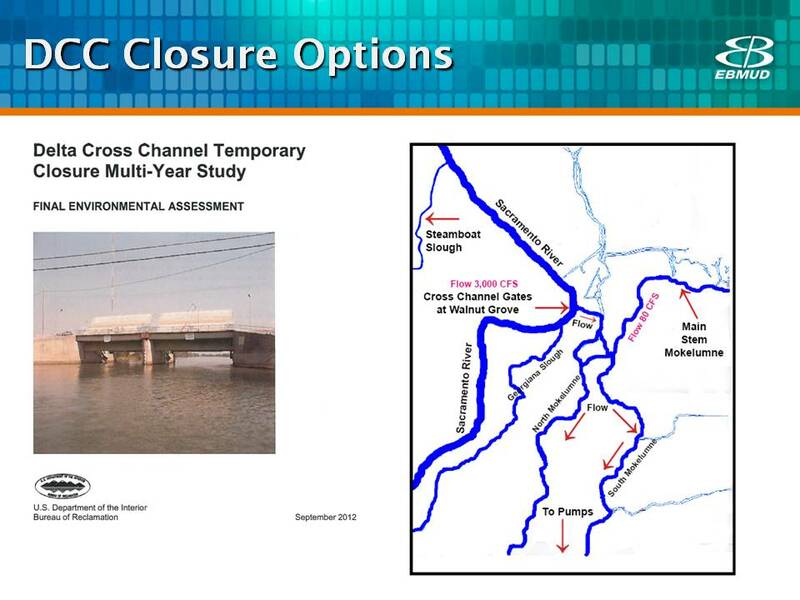 After the 2008 stock collapse of Central Valley salmon, they started initiating pulse flows in 2010 in an effort to get attraction flows down the Mokelumne to see if fish can move up from the Delta in a more aggressive way and overcome some of the issues associated with the Delta Cross Channel. Sometimes it’s the flood control water in that October-November period and instead of releasing it in a more regular pattern over the summer, they hold on to it and pulse it out late September, October, and November; sometimes it involves asking the State Board for an adaptive management action to shift water from one season to another by dropping below their minimum flows, collecting all the water up, and releasing it in the fall; and sometimes water becomes available through the Freeport project, he said. 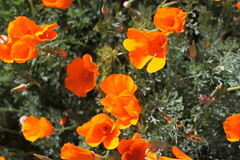 During the drought, there were issues with the reservoir water temperature. 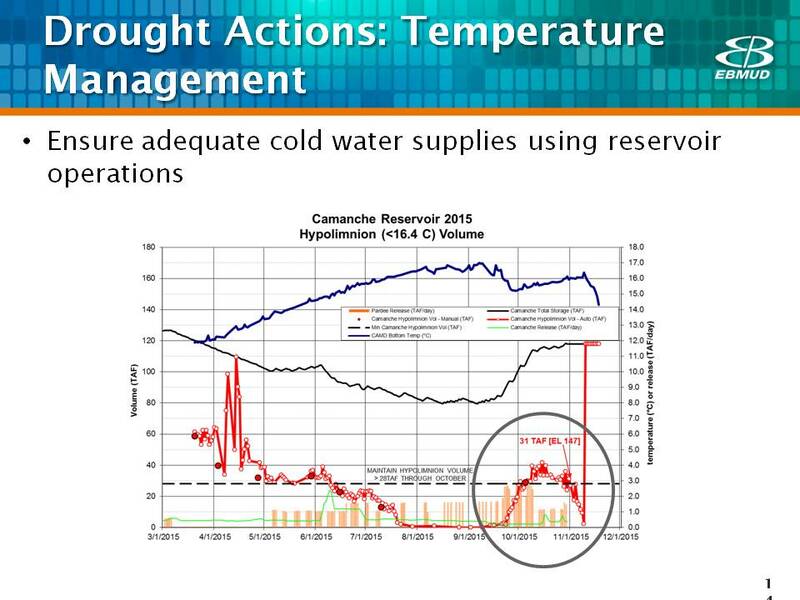 In 2015, there was very little water left in Camanche Reservoir, so the question before them was do they attempt to keep the water cold or store the water in the upstream reservoir to keep it colder and release it in one big slug in October? The partnership decided to take the risk, even though it could have ended up killing steelhead in the hatchery, and although other hatcheries ended up moving their fish, they were successful and did not have any fish kills. “In fact, that year we had some of the coldest water below Comanche that we’ve had in the last decade or so, so something to think about for future management,” Mr. Setka said. 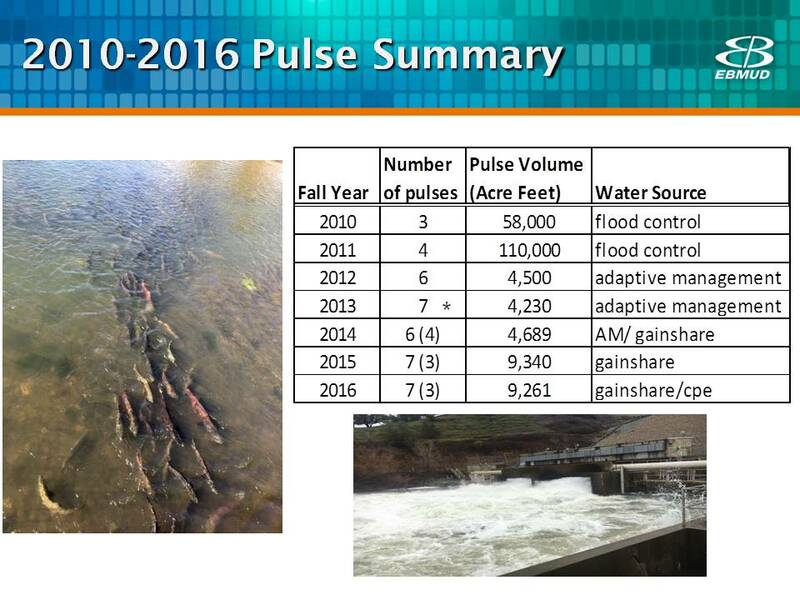 He presented a slide showing the 2016 pulse flows, noting that the blue line are the pulse flows going past Woodbridge Dam and the bars represent the number of fish moving up on each of those pulses. Mr. Setka then reviewed the outcomes of the Joint Settlement Agreement, which was the result of the lawsuits in the late 80s. 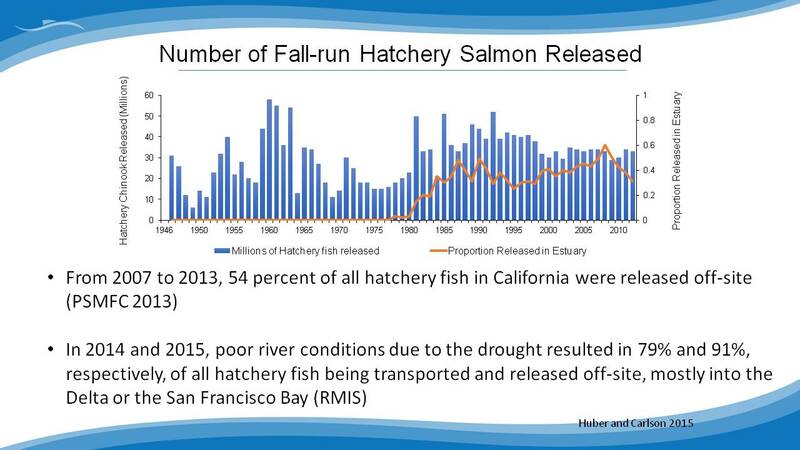 “In the post-JSA period, the number of fish has more than doubled returning to the Mokelumne,” he said. “If you take out that stock collapse in 2008, right now we’re running an average of about 9000 fish per year, post JSA. 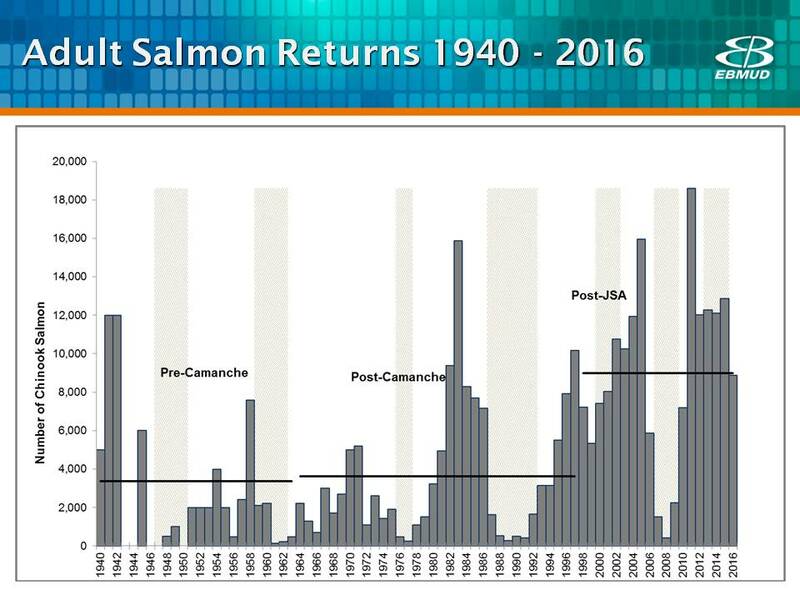 Our AFP doubling goal which is that federal goal that was laid out by the CVPIA is about 9000 fish, so we’re kind of right on target with that.” He noted that the graph does not include 2017 returns, which exceed 9000 fish. They are currently conducting a study started by the Foothill Conservancy to look at the habitat above Pardee Reservoir, considering climate change and the future. “Right now we’re doing a habitat assessment to see what exactly the habitat is there, and as we roll into the future, our hope is that we’ll be able to move some fish up there, and do the proper tagging or not and see how they perform up there and what their survival is and have that ready to go as one of the options in the portfolio,” he said. 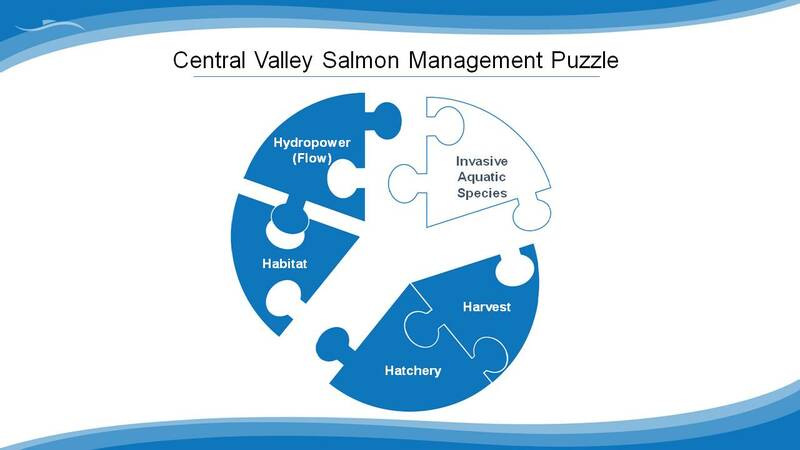 The partnership is also looking at improving conditions downstream in an effort to improve survival of outmigrating salmon. The McCormack-Williamson tract project has been in the works for decades, but hopefully will soon have floodplain habitat available for young salmon as they migrate out to the ocean, he said. Coverage of the Mountain Counties Water Resources Assocation’s Delta and the tributaries forum concludes with keynote speaker, Delta Watermaster Michael George, and a lively panel discussion moderated by Dr. Jeff Mount, senior fellow with the Public Policy Institute of California.